No more early rides without having breakfast from this point on; Nat made it crystal clear that she did not care whether we had to ride 900 km into the Sahara desert before sunset or whatnot, she was not getting on the motorbike without proper breakfast. So we left the hotel and got breakfast like normal people do, and then got changed, loaded the bike and headed south to visit Cadiz. We got there quickly, there was not much traffic, and taking advantage of being on a motorbike we rode up to the entrance of the Fuerte de San Sebastián, parked there and took a walk. Built in 1706, it contains a metal lighthouse which was the second electric one in the country. Some of you might recognize the place from scenes in the James Bond film “Die Another Day” in which Pierce Brosnan goes to Havana. It was probably much easier to shoot here than on location in Cuba! 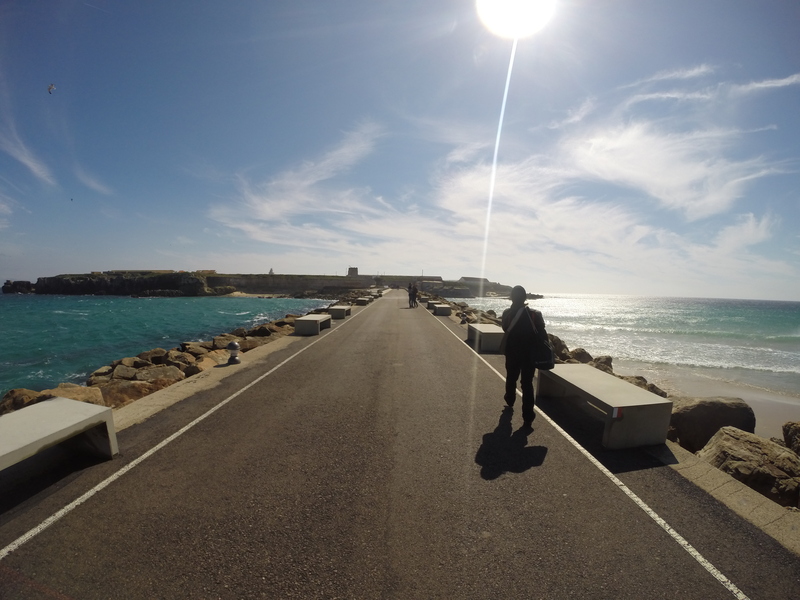 We took a quick ride around the old part of the city and then headed to Conil de la Frontera, where we intended to leave the main road and follow the coast all the way to Tarifa, the southernmost point of continental Europe. We tried to stop at Conil, but the traffic there was hell, lots of tourists trying to get to the beach, and besides it was starting to get too hot to push the motorbike around in those conditions, so we went on to out next stop: Zahara de los Atunes. Now, this was more like it – even though it was sunny and the temperature was quite high if we stopped, the breeze coming in from the sea was quite chilly, so we were very comfortable riding those wonderful roads along the coast. The day was a bit windy, and we saw a lot of people practising kite surf on the beach. 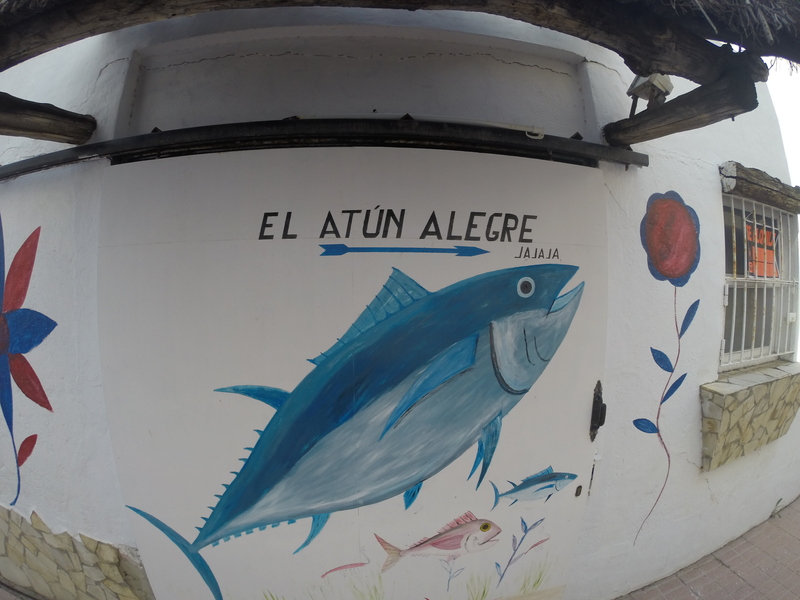 We rode through Barbate, well known for its “pescaitofrito” and we saw indeed fish being unloaded from the boats and several small kiosks by the road from which the tempting smell of fried fish came out. It was a bit too early for fish, so we went on. By the time we got to Zahara it was already lunchtime, and seeing that the place looked much quieter and welcoming than Conil, we decided to stop and have some tapas. 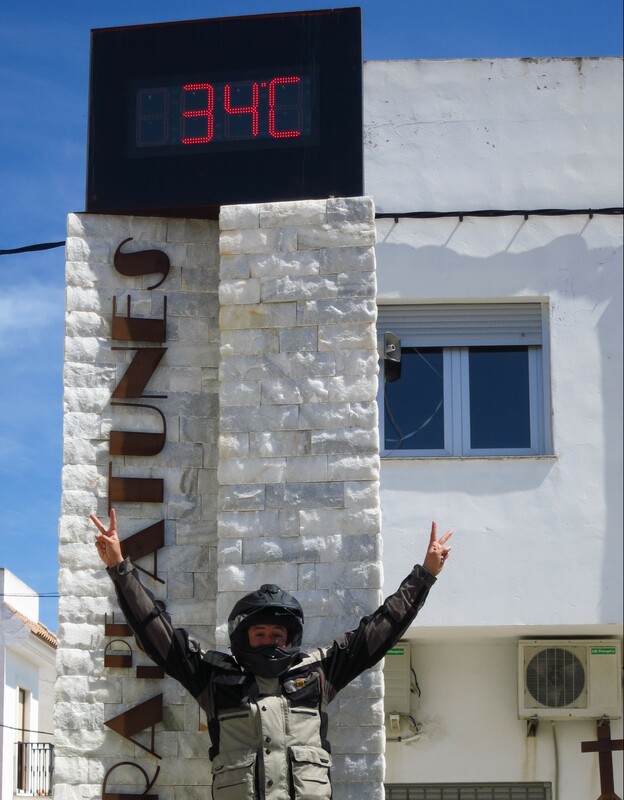 We parked the motorbike right in front of a terrace, and the moment we stopped moving we quickly felt how high the temperature was. We took refuge in the shade and ordered some beer, salmorejo with tortilla de camarones and chicharrones. I cannot find the words to describe how absolutely delicious it was. We tried to take a walk, but at 34ºC and wearing motorbike trousers and boots, it was not the best idea, so after seeing the beach we got on the bike, happy to feel the cool wind again. And quite windy it was… as we approached Tarifa the breeze turned into wind, which turned into a gale by the time we got there after riding through some nice hills by the coast. We parked the motorbike the best we could to protect it from the wind and make sure it was not blown over on its side and took a walk across a narrow road that connects Tarifa to the Isla de las Palomas. The island is the southernmost point in Europe (if we do not count overseas territories like the Canary Islands, Réunion or the Falklands) and I found it fitting that I had got there on the same motorbike that in 2013 had taken me to the northernmost point of Europe, the Nordkapp. Africa was easily visible from here, and my wish to walk to the other side of the island and get a good view of the other side of the strait was crushed when we discovered that the island was closed off by the Spanish government, the causeway that connected it to the mainland leading only to a locked gate. We walked back to the motorbike, the Mediterranean to our right, the Atlantic to our left, a very strong wind blowing sea spray and sand into our faces and making it difficult to walk upright. Next and last stop of the day was Gibraltar, which I was very curious to visit. The rock was given to Great Britain in 1713, at the end of the Spanish war of succession, as part of the Utrecht Treaty, and has remained a British territory ever since. There is a border that has to be crossed to access it, and it is infamous for the long traffic queues that form there in rush hour, only made worse by the weird fact that the access road crosses the runway of the rock’s airport and has to be closed like a railway level crossing every time a flight has to land. We just skipped to the front of the queue, usual procedure on the motorbike, showed our ID cards to the border police and were let in, it was a funny feeling knowing that I was riding my motorbike on a real runway. We wanted to get to the top of the rock, but it is a natural reserve and people wishing to access it must pay 10 pounds per person plus 2 pounds per vehicle, which made the total price 22 pounds, a little over 30 euros at the time of writing this article. Too much, we tought, and in any case it was already getting late and there was still a long way to go before reaching our final destination, Ronda, which was about; so we went to visit Europa Point, overlooking the strait from the other side of the rock, and in the end we did not need to pay anything to see the famous monkeys that live in Gibraltar, there were plenty of them on the way to the Point. Even though it was late, I refused to take any more motorway on the way to Ronda, even if it was just a little, so up we went on the A-405 and the A-369, starting from Miraflores, and I immediately knew it had been the right decision. The road was good enough to keep up a decent speed, meaning that we were not going to take too long to reach Ronda, but at the same time it was interesting enough, with a combination of good landscape – green hills dotted here and there with the typical Andalusian white villages – fun corners and little traffic. We got to Ronda by sunset, and this time we were lucky, the hotel was not in the way of any procession, even though we had to ride around the city to enter from the north in order to reach it. The motorbike in their underground car park, a shower, a change of clothes and we hit the streets to find a nice place to have dinner. Ronda is a stunning city that has won the heart of many writers that over the centuries braved the hard roads that crossed the mountains to reach it and drink its charm, a mural in the old town containing their quotes from novels and poems witness to this. The city is placed high on a plain that is split in two by a deep canyon, at the bottom of which runs the river Guadalevín. Three bridges connect both sides of the city, the most impressive the Puente Nuevo, new bridge, quite a misnomer when we learn that it was built in 1751… It is a massive 120-metre tall stone structure that is lit at night, so we were able to admire it even though it was already late at night. Not only were able to see the bridge, but we were lucky enough to catch a procession crossing it the moment we arrived there, it was the best view possible view of the bridge. 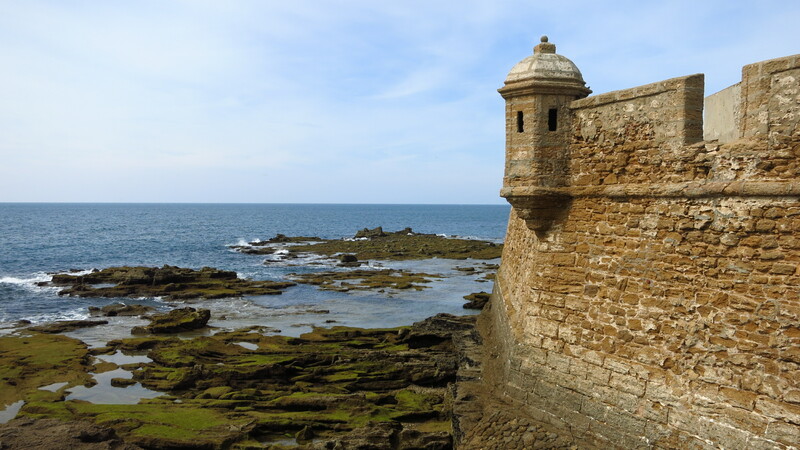 This entry was posted in Portugal and Southern Spain 2015, Travel and tagged Cadiz, Conil de la Frontera, Gibraltar, Ronda, Tarifa, Zahara de los Atunes by Kilian. Bookmark the permalink.